Here is your guide to Band Alumni activities, tailgating, tickets, and parking. Bring a dish to share. Grills will be available to cook. The forecast says morning rain and AFTERNOON SUN! So we should be nice and dry for halftime and postgame. The high is 57, so should be a PERFECT WEATHER halftime. Return instruments (in cases), music, lyres to Equipment Staff beneath Section 1 of stadium. And after “My Way,” all brothers and sisters of KKΨ, TBΣ, ΦMA, ΣAΙ, and ΦBΔ, will gather at the 50 yard line. Bring your kids and partners to march WITH THE UMMB! The parade steps off at 10:00 am. Report time is 9:30 SHARP at the Band Building. NOTE: Below is last year’s map. Parade will START at Haigis Mall, and END at the stadium. The route through town remains the same. Parade Route (click map to enlarge). The band has some horns (mellos, euphs, tubas), flags, and percussion equipment for alumni band members to borrow. Please indicate so when registering. REQUIRED: Fill out this “rental form” to help us get a horn for you. 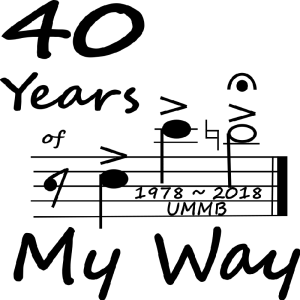 Due to the size of the UMMB this year, there is EXTREMELY LIMITED availability outside of mellos, euphs, tubas, and percussion. Woodwinds MUST PROVIDE their own reeds and neckstraps. If you need another type of horn, please borrow one from a friend, or consider playing a different horn we can provide (for example, you played trumpet, but we can loan you a mello). Please do your best to buy or borrow one. The band has a few to loan out (including Flutist Friends), but it’s first-come, first-served. Band Alumni Tailgate is where you want to be! Our tailgate area is on the grassy lawn outside the Football Performance Center at Yellow Lot #11. In partnership with the Band Parents Association, we’ll have tents and grills available for use. Please note that Yellow Lot #11 is for season ticket holder parking only. 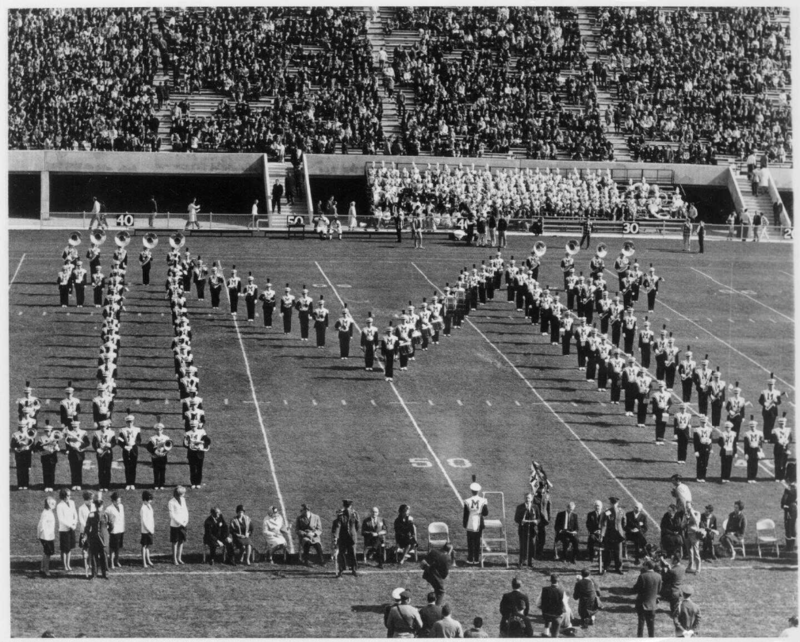 Participating members of the halftime alumni band will be comped one (1) ticket each. 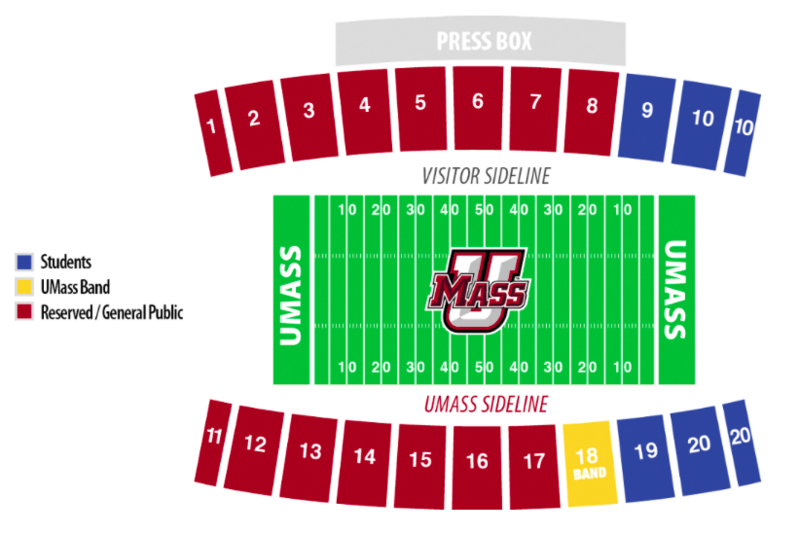 Additional tickets are available through UMass Athletics. If you arrive late, be aware that tickets are scanned throughout the game. Where should we sit during the game? Sections 5-7 on the press box side are ideal for watching the UMMB perform during the game and at halftime. Section 17 is good for those who wish to sit with the band during the game. The band performs its halftime show to the press box side. All stadium parking is paid parking. If you show up on gameday and buy a game ticket at the gate, parking will be $10 cash. If you purchase parking online ahead of time, it’s just $5. Lot #11 is reserved for season ticket holders. 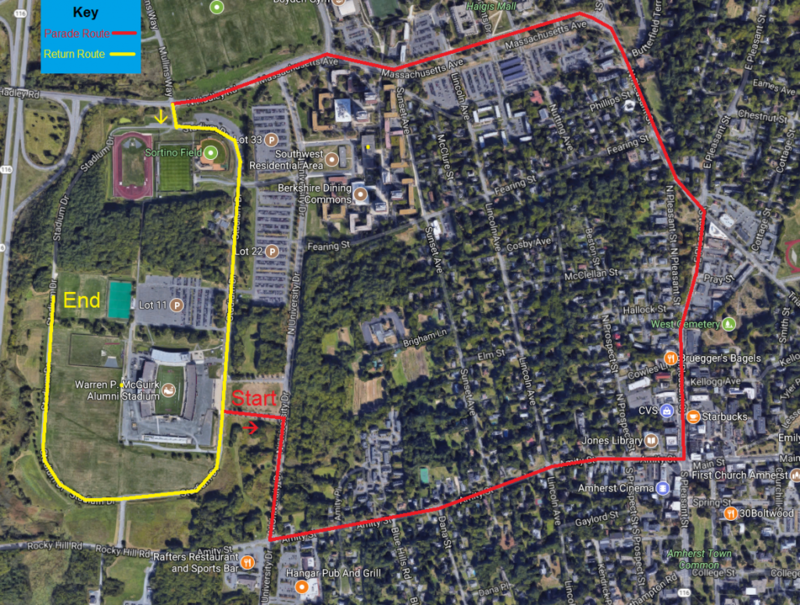 If you choose to walk from campus lots, the closest available free lots are beyond the Mullins Center and the Visitors lots across from Whitmore. To park close to the Band Building, use Hicks Way Red Lot #64. This is between the Band Building and Commonwealth Honors College. Exactly how do I register for the alumni band? If not attending reception, there’s a link the FAC Box Office to buy Multibands tickets. Registration NOT required for tailgate, playing in stands, or My Way sing. Can local residents who are not alums join in? I work at UMass, but, alas, I’m not an alum. My son (13) plays a mean trombone and would love to participate. Is that possible? We love a mean trombone! Do you play? Your son — and a friend — are very much welcome to join us for the Homecoming Parade and/or play with UMMB in the stands during the game! For the parade, we’re asking alumni and their families to meet the UMMB at the stadium main gate by 9:30 (parade steps off at 10:30). And if he’s going to the game, join the UMMB in section 18. Send me an email at keithpaul@alumni.umass.edu if you/he/they will join! Fantastic! Thanks, Keith. I play a little (not so mean) piano. And every time I try to carry it in a parade, I end up regretting it. My son might be able to persuade one of his fellow Belchertown bandmates to join in, though. I’ll run it by him and be in touch. I am worried about parking. My mother has very limited mobility. Will I be able to drop her off and then park? I plan to prepay $5-. I also need tickets…1 senior, 2 adults and 2 students…is it okay that my son is a student at another University? We can’t WAIT to see the band perform..,alumni and baby band! Go UMASS! Do you know what section the alumni band’s comp tickets will be for? It’s never been a problem in the past with us disregarding the assigned seating, but I’m always nervous that at some point it will be. Alumni can sit in sections adjacent to band (17 or 19). Is alcohol allowed in the tailgate area? Yes. But campus police will be on alert and may check IDs. There does not appear to be a link anywhere that takes you to a form to actually register for any of the Homecoming band activities. Can this either be posted somewhere or emailed to me? Registration isn’t yet live, but is coming soon. Stay tuned!